This badge was issued to Paisarn Rojanaphusit on 15 Jun 2017. 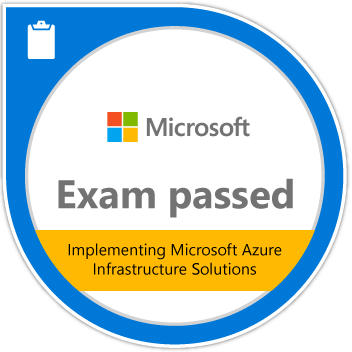 This exam is for candidates who are experienced in implementing an infrastructure solution in Microsoft Azure. Passing this exam validates a candidate’s ability to design, implement, and manage Azure App Service Apps, Azure Resource Manager Virtual Machines, storage strategies, Azure Active Directory, virtual networks, and ARM templates.